Watch how this Rug Doctor Deep Cleaner was able to clean out a big coffee stain that was a couple of days old. It took only one pass, which is pretty impressive. Since the 70s, the Rug Doctor company has been helping people get professional quality carpet cleaning results in a DIY manner. All their machines, including this upright Deep Carpet Cleaner, is based on water extraction technology. This means that wet scrubbing technology is used to deep clean the carpets, after which dirty water is suctioned back into the machine. This is very effective for stain removal from carpet fibers. Many people prefer water extraction to dry carpet cleaning methods, or manually using a rug and detergent to rub stains off from the carpet surface. You can see the cleaning power demonstrated in the video above. Most people know the Rug Doctor machine to be their larger Mighty Pro machine, which is the ubiquitous rental machine. Not as many people know of this Deep Cleaner. This at-home upright Deep Cleaner used was introduced in 2015, and has been rising rapidly in popularity based on good reviews and it’s solid construction. A lot of home users prefer the flexibility of having their own carpet cleaner machine at home. 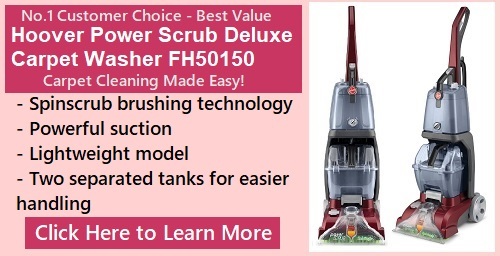 In the past Hoover and Bissell have dominated the at-home upright carpet cleaner market. 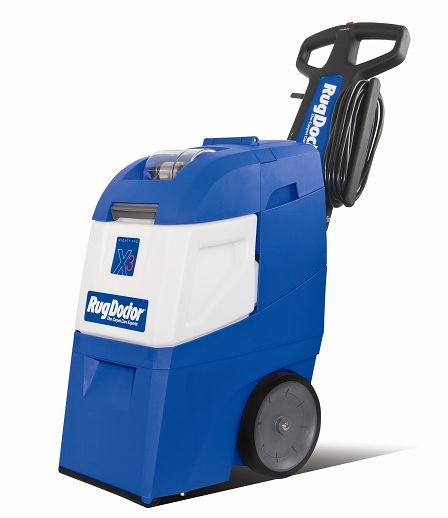 However, Rug Doctor has been gaining market share through this machine, as well as it’s relatively new Rug Doctor Portable Spot Cleaner. For sure, the Rug Doctor is giving Bissell and Hoover a good run for their money. What’s great is that Rug Doctor is focused on providing a select few core high-performance machine models to customers. Unlike its competitors, it does not push out multiple models that are almost the same for marketing purposes (but very confusing for shoppers). For another video, take a look at this professional presentation on the Rug Doctor Upright Carpet Cleaner. This one goes into a good level of details. Why Get an At-Home Cleaner? Keeping an at-home deep cleaner is not only more convenient than having to rent and then return a machine within a day, it is also great for impromptu clean-ups when everyday spills happen (Eg. pet, coffee, food stains). In addition, it can be more sanitary to keep a machine exclusive to your home. You don’t need to drag the machine in and out of the home, nor do you need to share it with others that you don’t know. This dance studio owner had the unfortunate experience of renting a Rug Doctor with blood stained water left inside. According to Rug Doctor, this machine has superior suction when compared to other at-home upright cleaners by their competitors. This is an important point for deep carpet cleaning, as the ability to suction back in the dirty water leaves the carpets and rugs cleaner. Another key feature of the Rug Doctor Deep Carpet cleaner is its Dual Cross Action Brushes. This cutting-edge technology has been specially developed by a company that understands what it takes to remove dirt stains from carpet fibers. The cleaner also comes with separate clean and dirty water tanks, large wheels for easy maneuvering of the cleaner and a handle that folds down for easier storage. One user with two kids, one dog and two cats has trouble keeping her carpets clean. She found the Rug Doctor Deep Carpet Cleaner a high quality purchase that really helped. She has purchased machines from other major brands, and she found this cleaner to have the best plastic construction. Compared to others, she felt that it was much less likely to break. The results were outstanding, and the best out there for a domestic grade cleaner in her opinion. There are lots of similar user reviews like this. Some people who have never used a home carpet cleaner before are worried that the machine will be difficult to operate. Actually, it’s not difficult. You can watch this short video to learn more. If this machine interests you, check out the full review on our website.